The hatchback segment of cars in India has just witnessed a new entrant – in the form of Fiat Punto Evo. 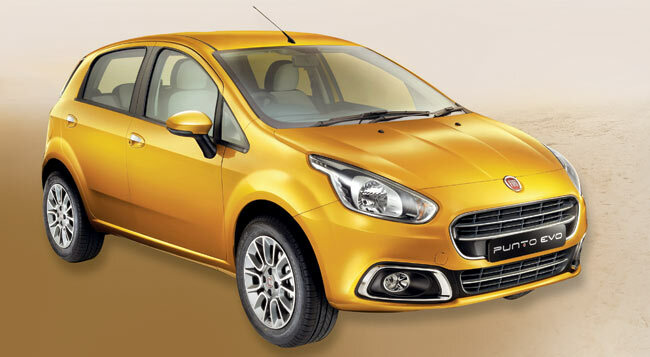 As Fiat was working hard to improve its infrastructure so that they could provide all the services to make their consumers happy and now that they have launched the facelifted Punto Evo in the Indian market it once again has raised the stakes quite high for the Italian auto manufacturer in the Indian market. Although Fiat has not made any mechanical changes under the hood of this new hatch still the facelift Punto Evo offers a lot with it. The new Fiat Punto Evo is available in 3 trims namely Active (Base), Dynamic and Emotion beside the Sport 90 Hp (Diesel). And for petrol, it is priced at INR 4.55 lakhs for base trim and INR 5.12 lakhs for dynamic and 6.65 lakhs for emotion. It does not make any changes in the engine side Fiat Punto Evo and all the 3 engines which include the 1.2 Litre, the 1.4 Litre Petrol and the 1.3 Litre Diesel has been carried over even in this facelift hatch. the 1.2 Liter base petrol engine produces about 67 ps of peak power at 6000 rpm and 96 Nm of peak torque at 2500 rpm while the more powerful and enthusiastic 1.4 Liter Petrol produces 90PS of peak power at 6000rpm and 115Nm of torque at 4500rpm. Fiat Punto Evo also has diesel engine option too the 1.3-litre Multijet diesel engine is a very popular engine and it does duty in some of the other popular hatchback cars of India it is available in two states of tune one producing 75 bhp of power at 4000 rpm and 200 Nm of peak torque in between 1750-2000 rpm. While the other produces 92 bhp of peak power at 4000 rpm and 210 Nm of torque in between 1750-2000 rpm. All the above engines are mated to a 5-speed manual transmission. The dashboard surely looks appealing with the modern touch and smart new materials, the top end Punto Evo comes with all black interiors while the rest of the variants are available with dual tone interiors with the combination of Black and Beige trim. But we got to admit the best-looking part of the dash definitely is the Piano finished centre console which houses the entertainment system. The big steering wheel, however, has been carried over from the old Punto hatch, the top end variants even get steering mounted controls on them. The instrument cluster to looks nice and sporty with all those information and warning icons blinking in red, it even has a digital screen which shows important information. The rear profile of the Punto Evo however looks almost new just like the front end it gets a restyled rear bumper with chrome surrounds for the Auxiliary lights but the eye catching feature however got to be the new tail lamp units which have LED strips inserts definitely raise the standards of this hatch quite high. Among its predecessor, it is decent and excelled in ride quality with assured performance. With a few modifications and trims, Punto Evo again struck the market to create a distress among the rivals.